To reduce some of the shuddering on take off some models display and increase speed and power through the low and mid ranges of acceleration. 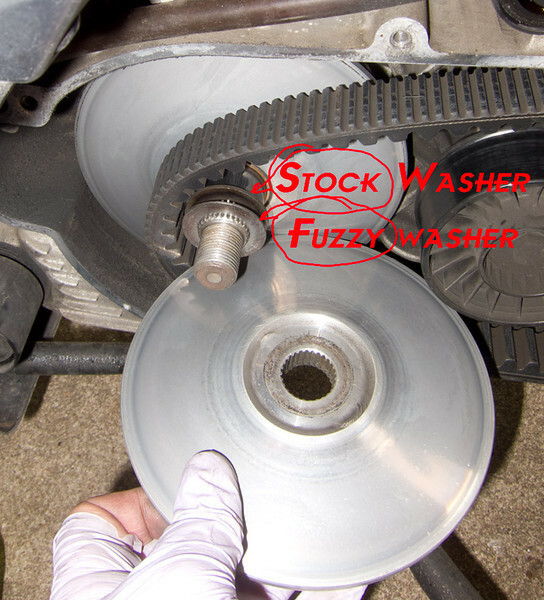 The performance modification referred to as the "Fuzzy Washer" (conceived and researched by MV Member Fuzzy) is an additional spacer that is added to the stock spacer to increase the distance between the variator sheaves. This allows the belt to drop lower in the pulley which, in effect, starts the transmission in a lower gear by slightly reducing the gear ratio. A common width for this spacer is 1mm whether it is a stock washer or specially made for models with thicker stock spacers. Some MV Member have experimented with thicker Fuzzy Washers. If the washer width is too wide the belt could hit it. On some models the increase in low to mid range performance, if any, may be so minimal as to make the slight reduction in top end not worth the trade. With the variator front sheave removed as in the picture below simply slide an appropriate Fuzzy Washer on to the crank an push it and the stock washer up to the bushing. Then assemble the rest as normal.